How to use scales with VIENNA Advantage POS System? VIENNA Advantage > Retail Industry-Template > How to use scales with VIENNA Advantage POS System? In this article we are going to explain how weigh-scales communicate with our POS system when measuring different products such as fruits, vegetables, sliced cheese, ham, etc. Before starting to read this article you may want to check the previous articles from our Retail & Supply Chain Management Series. In this way, you will get more profound insights of our Retail & SCM Industry-Specific Template. A good POS solution should enable a scale connection to your existing POS system. This is a standard feature in VIENNA Advantage Point of Sale, and here is how the process works. First, go to the product category section, and choose the desired category; let’s say vegetables. 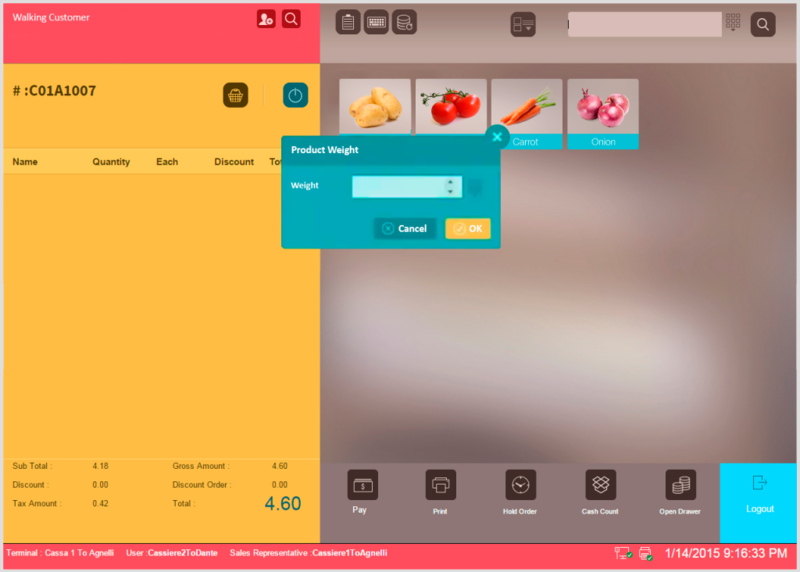 A new window will open from where you can choose the desired product; in our example “tomatoes”. See picture below. After choosing the product you want to measure, put the product (in our example “tomatoes”) on the scale and the system will automatically contact the scale and calculate the weight and the price. If you do not have a scale connected to your POS system, after choosing the product you want to measure, the POS system will automatically open new window, where you would be asked to enter the product weight manually. See picture below. There are various possibilities to scan or enter a product with a variable weight. One option is to measure the product on a scale, and directly print a bar code and stick it on the measured product. In this case, each product has its own bar code that will be scanned on the cash counter. But what happens if there are 2 same products with different weight? Let’s say you have taken 1kg tomatoes, and after a while you have changed your mind and took additional 0.5kg tomatoes. It is the same product, “tomatoes” but it will have 2 different bar codes because of the different weight (1kg and 0.5kg). When this 2 bar codes are scanned on the cash counter, the POS system will automatically sum up the quantity and will show the tomatoes in 1 line with 1 price on the POS Screen and on your receipt. Second option is when the products with variable weight have already assigned bar codes by the supplier. This is usually done when the supplier is responsible for packing the products with variable weight. In this case, the price (instead of the weight) of each product is incorporated in the product bar code. Two pieces with different weights from a same product will have different bar codes, as well as different price. When these 2 bar codes are scanned on the cash counter, the POS system will show them as 2 separate lines with 2 separate prices on the POS Screen and on your receipt. Third option is to install a scale at the cash counter; in this case, the products are manually measured at the check-out and the quantity is entered manually in the POS system. VIENNA Advantage POS system has anything you need for your store, accessible from wherever you sell! From the text above, it doesn’t seem entirely clear: With a scale attached, the weight will be able to be auto-transferred to the POS, correct? That’s correct! If you have a scale connected to your POS system, the weight will be auto-transferred to the POS. Wins 2017 Rising Star and Great User Experience Award from FinancesOnline!